Spring is the season of warmer weather, blooming flowers, the leaves returning to trees… and air conditioning maintenance. With summer around the corner and the temperature already rising, keeping your AC in good shape should form an important part of your spring routine. Here are 3 benefits you’ll enjoy from scheduling maintenance every year for your air conditioning system. 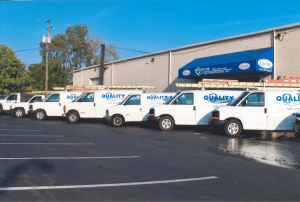 Contact Quality Air Heating and Air Conditioning to sign up for one of our plans for air conditioning maintenance in Columbus, OH. Our NATE-certified technicians will give your AC the treatment necessary to work its best throughout the summer. Fewer future repairs: Regular AC maintenance is often called “preventive maintenance” for a good reason: it lessens the stress on the system and prevents the need for many potential repairs. After a technician has made the necessary adjustments, cleanings, and replacements in the system, the air conditioner will operate will far less chance of developing expensive repair needs. Regular maintenance will keep repairs to a bare minimum until near the end of the system’s lifespan. Reduced chance of a breakdown: A maintenance check will catch repairs that, if left untreated, could lead to the system breaking down during the summer. Of the 23 most common malfunctions that will cause an air conditioner to fail, 16 can be detected during routine maintenance. Maintenance also lowers the stress on the system, which will prevent more troubles from cropping up as the AC works throughout the summer. Your chances of getting stranded in the heat with a broken air conditioner waiting for emergency repairs to arrive will be much less with the annual maintenance taken care of. Energy-efficient performance: The average AC works approximately 2,000 hours during the year, most of it in summer. This requires a significant amount of power. If an air conditioner is contaminated with dirt and dust, or has malfunctioning and deteriorating components, it will work far harder: even a 10% drop in efficiency will turn into a large energy waste over only 1,000 hours, and you’ll see the results on your power bills. With thorough maintenance, your air conditioner will work better and save you money all through the year. At Quality Air Heating and Air Conditioning, our maintenance plans not only take care of your air conditioner, they also see to your heater during the fall. You’ll receive extra benefits such as priority scheduling and 20% off repairs. Call us today for the air conditioning maintenance in Columbus, OH you need to save money and stay cool all through summer and beyond.